My daughter has taken a liking to vintage clothing. She spends time searching the internet for lovely pieces to add to her wardrobe. Recently she decided that she wanted to wear a vintage dress to prom this year and began her search. This plum beauty showed up at our house last week. She calls it her "Great Gatsby" dress. 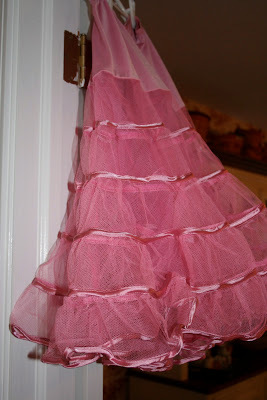 It has the prettiest drape of ruffles down the front. 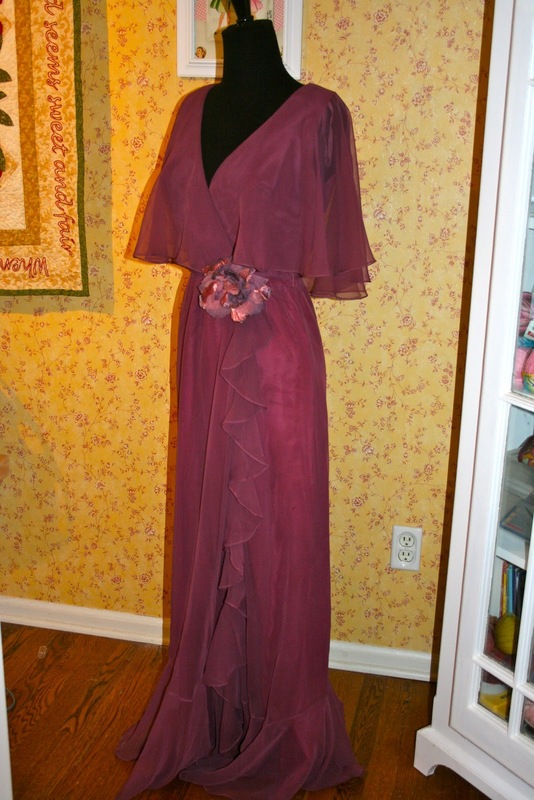 She found it on Etsy, a wonderful source for vintage clothing. 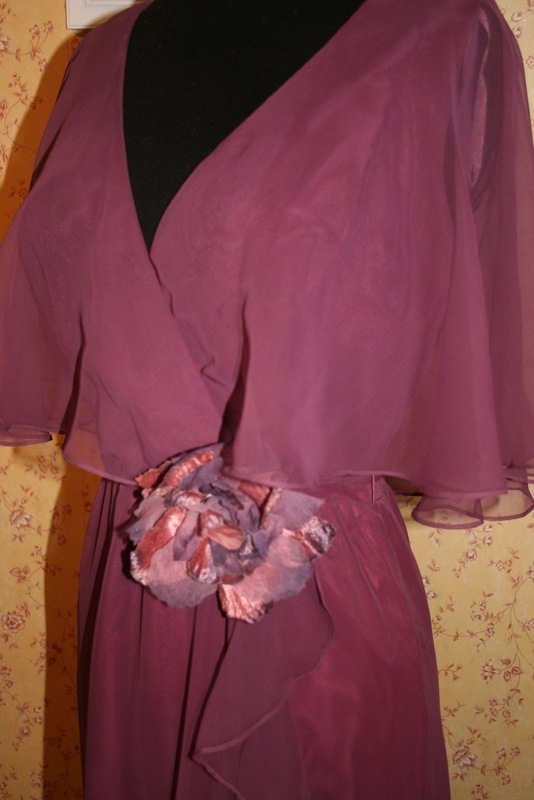 It is in excellent condition and was significantly less the cost of a brand new prom dress. She wants me to leave it on the mannequin so that she can see it daily. She has an important event this Saturday and is wearing this lovely crinoline under a black dress. The black dress is new but retro styled. I will show you pictures as soon as I have them. I'm working on a "Fascinator" for her hair. Do you know what that is? One of the blogs my daughter and I enjoy together is "Vixen Vintage". 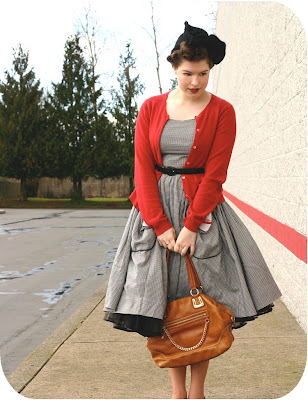 Solanah dresses daily in vintage clothes. She may wear new shoes or have new purses, but they look like something you'd find in another time and place. Her blog is really fun so take a look when you get a chance. Blessings! The prom dress is beautiful. I hope you share pictures when she wears it. So cute!! Please share pictures of your daughter when she gets all dressed up!! I love the dress! I'm sure she will look stunning in it. That's a lovely vintage dress. Will look forward to photos with your daughter all dressed up. What a beatiful dress. My son also loves to collect vintage clothes, and has found some charity shop bargains. I think it's wonderful that a young girl likes vintage anything. She will be very lovely and classy in that dress. I had to look up Fascinator. Please show us what you made for her. I will check out Vixen Vintage. I know you both must enjoy seeing the "Great Gatsby dress on your mannequin. She will be the "Belle of the Ball". It is nice to see the kids of today into Vintage. It shows they have creativity. Gorgeous dress for a Gorgeous Girl!!! This young lady is no doubt a reflection of the past and her website is just fascinating...Since I sew celebrate that era..please let her know I placed her on my blog roll...she is an absolute delight.